When I first tried to order from this place, I didn’t get to the checkout page. An error page kept popping up so I gave up. Two days after, a delivery guy shows up at my doorstep with the two bags. I was surprised. No call, no text, no confirmation email. He just showed up. And seeing as I didn’t think the order went through, I didn’t have that much cash on me (about 16k). So after complaining about the ambush I asked for his POS machine and he said he didn’t have one. I asked what he wanted me to do and he suggested using an ATM. I didn’t have the time for that as I was at work and I’d already had my lunch break so I told him to return the order and gave him a N500 tip seeing as it wasn’t his fault and sent him on his merry way. I ordered the same bags again and this time, there were no hassles. I got the bags and paid even though there was still no confirmation call. The next time, I got a wallet which took FOREVER to come for whatever reason and I was the one who kept having to call to ask what was wrong; and let me just tell you know, their customer service is CRAP!!! A very rude lady picked up the phone every time and even the person on the other end of the BB (probably the same individual) showed such horrible manners and kept telling me ‘You would get your purse pliz.’ And I paid online o! In all sha, I’d give the place a 2 and half over 5. Good quality but slightly over-priced bags, poor service and okay delivery. PRICING: 3/5. 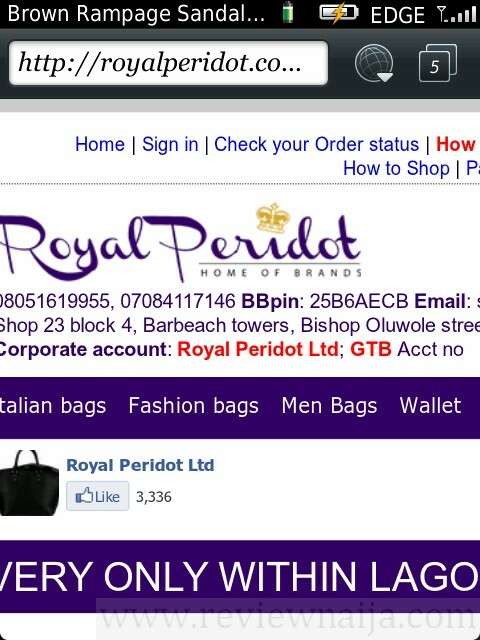 Got some of their bags off Konga.com at a fairly large price margin. DELIVERY TIME: 3/5. Could be better. I paid N24000 for a bag on 13/11/2015. When the bag arrived, it looked cheap so I requested for a refund immediately. Since then, its been send a mail to us with your account details and we will refund. I have sent many mails but no response from them since. I dont get gow these people function. i ordered 2 bags, one was damaged and i reported it immediately. no reponse for 72 hours. when i called, they said i should return it and pay the courier fee? who does that? Good quality. Very poor service. Customer care seems overwhelmed with work. If you order just get ready to keep calling because you won’t get feedback. Then delivery takes eternity. To think I paid before the items were brought. Not sure if I want to do business with them again even though I like their products. Well… they have treated me pretty good. same experience wt u sonia. really snail paced delivery. Im yet to get a wallet i ordered snce 22nd october 2013. Its now over two weeks for what they say takes 2-4 days. I jst hope i get my purse.